Kevin Rosso, Pacific Northwest National Laboratory, talks with Patricia Huestis, University of Notre Dame, about her research on surface and bulk effects of heat and radiation on boehmite. Enlarge Image. Congratulations to the IDREAM Energy Frontier Research Center on their latest all-hands meeting. At this 3-day event, researchers and advisors discussed how the center is answering tough questions about complex radioactive environments. 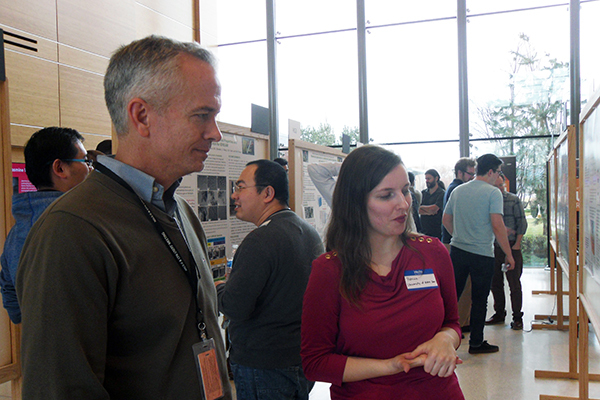 Throughout the gathering, scientists from Pacific Northwest National Laboratory, Georgia Institute of Technology, Oak Ridge National Laboratory, University of Notre Dame, University of Washington, and Washington State University presented their research and shared ideas. Their efforts were rewarded with thoughtful insights from the center's advisory committee. The advisors gave detailed advice about the current research and future directions. At the meeting, two popular collaboration events were the poster session and the early career dinner. At the poster session, scientists spent nearly 2 hours talking about their work, whether that was reactivity in highly alkaline electrolytes or the influence of radiation on such systems. At the dinner, graduate students and postdoctoral fellows, many of whom had never met in person before, became fast friends over the task of building the tallest freestanding tower that could support a marshmallow. The bragging rights went to a trio from Washington State University: David Semrouni, Trent Graham, and Tyler Biggs. In addition, the scientists had in-depth conversations about the best practices and upcoming plans for sharing their results. They also discussed data management, including the need for access and context, and planned for upcoming scientific publications in high-profile journals. "Within IDREAM, we benefit tremendously from the energy and enthusiasm of all team members, especially our early career scientists," said Dr. Sue Clark, IDREAM Director. "We also benefit from the constructive comments we receive from our advisory committee." The team is already acting on the advisory committee's suggestions and taking steps to further elevate the research as they go into their mid-year review with the U.S. Department of Energy, Office of Science, Basic Energy Sciences, which funds the center. The all-hands meeting was held in Richland, Washington, from January 14 through 16, 2018.